In front of me are three books about Donald Trump, along with a book-shaped object purporting to have issued from the pen of Trump himself. Before we talk about these publications, we might as well acknowledge that discussion of the printed word, in the age of Trump, is a laughably pointless endeavour. Clearly, we’re past the point at which books can alter the course of events. The asteroid is bearing down on us now, fringed by its raging orange mane. Either it will miss us narrowly or it will hit us. Talking about it will do us no more good than staring at it in mute horror. Then again, there is no subject we want to talk about more. As long as we know we’re wasting our breath, there seems to be no harm in proceeding. If words still mattered, the ones that routinely emerge from Trump’s own mouth would have sunk him long ago. The point is proved by The World According to Trump, a slender but damning selection of his most asinine utterances. The book is billed as a work of humour. Whether you find it funny will depend on how dark you like your comedy. Speaking for myself, I feel it’s a bit early to find Trump funny at this stage, as well as a bit late. “Heidi Klum,” Trump says. “Sadly, she’s no longer a 10.” No doubt it is hilarious, in theory, that a man who goes around saying such things, proudly and on the record, should consider himself a plausible successor to Jefferson, Lincoln, or even Richard Nixon. But if we want to laugh about that with a whole heart, maybe we’d better wait until he’s been denied access to the White House. Trump is a joke, all right. But it remains entirely possible, at the moment, that the joke will be on us. It’s hard to know what to do about the man. If he was merely a gaffe-prone duffer – if he was Dan Quayle, or George W. Bush – then a compilation of his idiotic sayings would embarrass him. But such a selection does Trump an accidental favour, since it permits the conclusion that he spends a certain amount of the rest of his time saying things that are not idiotic. This inference is to be resisted. This is not a book of blunders. This is what Trump talks like all the time. He wants to sound like this. His whole personality consists of sounding like this. Even on the evidence of his own book – especially on the evidence of it – Trump seems to have no core at all; he is a fundamentally unserious human being. When we quote a mere bushel of his verbal outrages, we distract ourselves from the forest of his total fatuity. Also we risk descending into the realm of debate, as if Trump’s radical, colossal unfitness for the office of the presidency still needs to be demonstrated. If it still does, it never will be. A recent newspaper article tells me that Trump has just been subjected to “weeks of scrutiny over his credentials for higher office.” Do the presidential claims of a figure like Trump really require anything so exalted as our “scrutiny”? Surely a mere glance in his general direction is enough. Except in a fairy tale, one doesn’t scrutinise a toad to check whether it’s a prince. Clearly, Trump has no idea where his mouth is taking him here. Two topics are in play that should never, ever, have been brought into public apposition: his own rank libido, and Paris Hilton at the age of twelve. Haphazardly, Trump shoves these live wires towards each other. Will they touch? He doesn’t even seem to care. The point is that he is talking, and you are listening to him. There would be less call for panic, if Trump confined his slapdash recklessness to the verbal realm. But shambling improvisation appears to be the hallmark of everything he does. The launch of the campaign precedes the having of a policy; the signing of the book deal precedes the hiring of the hack who will dream up the text; the approval of the crying baby mutates, with insane speed, into a demand for its ejection from the hall. With Trump, we finally seem to have left the concept of sincerity behind. “In business,” he flaccidly asserts in his book, “I don’t actively make decisions based on my religious beliefs, but those beliefs are there—big-time.” Does that sound like a man sincerely affirming his religious faith? It doesn’t even sound like a man faking it. But for an alarming proportion of Americans, Trump’s eerie lack of human content is not a concern. At his rallies, some of his fans don’t even stay to hear his stump speech. They soak up a bit of atmosphere, take some selfies, then split. There are other Trump boosters who, more oddly still, know that his policies are ad libbed fantasies, but don’t care. It doesn’t matter, in their view, whether he will end up building his fabled wall; what matters is that he wants to. If there is anything of substance at the bottom of the heap, it is supposed to be Trump’s business acumen. He will, we are assured, run America like one of his companies. His bottom line is the bottom line. In The Making of Donald Trump, the journalist David Cay Johnston, who has won a Pulitzer Prize for his financial reporting, shows that all this stuff is a fantasy too. As Johnston tells it, the story of Trump’s adventures in capitalism, far from adding lustre to the prospect of a Trump presidency, makes it even scarier than it already seemed. Admittedly, not many of us possess the savvy or acumen to have a phenomenally rich father. Trump’s dad was a real-estate mogul so notorious, in his time, that Woody Guthrie wrote a protest song about him, called “Old Man Trump.” Had Guthrie lived to witness the capitalistic offences of Young Man Trump, he might have smashed his guitar in despair. Before building the mighty Trump Tower, Donald was obliged to knock down the lesser erection that stood in its way. To do so he hired a crew of undocumented Polish workers who lived and slept on the site. They worked without hard-hats or goggles, while breathing asbestos dust without the benefit of face masks. But perhaps such items strike Trump as aspects of the “endless red tape” that must be slashed in order to restore America’s greatness. How has American democracy been reduced to Trump? In the must-read new Quarterly Essay, Don Watson addresses that question with his usual elegance. In several ways Watson is the ideal person to survey Trump’s America. As an outsider, he can do so with a measure of detachment. But he’s a lover of the country too, and a student of its traditions. The very tone of his voice – civilised, sympathetic, informed – is an antidote to the raging philistinism of Trump. As its title suggests, Watson’s essay is more about Trump’s America than about Trump himself. He leaves aside the question of what makes Trump tick. But Trump’s own book throws a surprising amount of light on that question, considering that he plainly didn’t write it himself. Whoever did write it, however, turns out to have an uncannily good knack of getting Trump’s personality on to paper. If the book makes him sound like a fictional character, a pantomime fatcat dreamed up by Dickens on a bad day, it only confirms one’s existing sense that this is what he’s really is like. If Trump didn’t exist, it would have been impossible to invent him. If you did, people would charge you with being grossly unsubtle, as well as crassly anti-American. He doesn’t just repeatedly refer to himself in the third person (“I was in full Trump mode.”) Nor does he stop at the additionally risible measure of invoking the “Trump brand.” No: his most typical staves have a self-puffing adjective or two thrown in as well, as in “the Trump quality brand,” or “the award-winning 52-story Trump International Hotel and Tower.” Trump’s book is a Freudian’s paradise. His inferiority issues, and obsession with the tallness of his buildings, are so flagrant that they scarcely need decoding. At one point he complains that the disclosure forms he had to sign, when formalising his candidacy, “weren’t designed for people like me.” Apparently he was reduced, in too many places, to ticking boxes that valued his assets at a mere “$50,000,000 or more.” This denied him the opportunity – which he now embraces – to record that one of his buildings is worth, according to him, 1.5 billion. It is hard to over-state how nakedly needy and assertive Trump’s language is, and how surreally starved of irony or nuance. When he wants to find some way of reminding you he’s rich, he just says it: “I’m rich. I mean, I’m really rich.” (His italics, of course.) Why don’t enough people find this stuff ridiculous? Why, on the contrary, does Trump’s brutally literal, cat-in-the-hat style strike some people as sounding pretty good? The depressing truth is that Trump occupies the sharp edge of a culture that no longer really cares about words. It still knows what they mean; but it is fast losing its ability to hear when they are absurd or laughable or sinister. Trump embodies this near-illiteracy, as well as profiting from it. Presumably he can read, in a technical sense. But he has famously declared himself too busy to read actual books. If we didn’t already know this, we could deduce it from his prose. “We have an amazing history. America is the greatest country that has ever existed on the Earth.” Trump does not say this as a prelude to discussing his full vision of American history. This is his full vision of American history. Admittedly, he throws in a few mandatory mentions of “the Founding Fathers.” But if he knows exactly who they were, he doesn’t let on. His conception of what made America amazing, back there in the days of yore, effectively stops at the presidency of Ronald Reagan. And it goes without saying, although it shouldn’t, that he knows nothing much about all the other nations that have “ever existed on the Earth,” except that America is greater than them. His worldview is just a scaled-up version of his rampant solipsism. This means we can look forward to a foreign policy that projects the paranoid vindictiveness of Trump’s business style into the diplomatic arena. “Every deal I make will have one objective: America wins.” America will stop getting “beaten in trade agreements.” It will be America versus its enemies, which means everyone else. “Does anybody reading this believe that I’m concerned about making other countries feel good?” Unlikely, mate. Or perhaps, confronted by a target like Trump, Twain would have simply given up. There is something about Trump that defeats language, which was exhausted enough already, before he came along. Here is a man who really is a bigot and a racist and a misogynist – a man whose considered response, when he is bettered by a female journalist, is to announce that she must have been menstruating. But just when we need them, words like “misogynist” turn out to have lost all power. They’ve been worn down to nubs by our culture’s fearless detectors of microaggression. So now we have no words left to level at Trump, maestro of the macroaggression. No doubt he is popular, in part, because his supporters have had a gutful of political correctness. One can forgive them for that much. But if your house is infested by mice, the buying of a pet leopard is an inadvisable response. Perhaps the sober Don Watson is right: perhaps the American experiment has already proved durable enough to survive a Trump presidency. Then again, a Trump presidency would be a kind of experiment too. How it would or will turn out we can’t know. All we can say with confidence is that Trump doesn’t know either. In several alarming respects he recalls the career of Evel Knievel, who was a master of hype and showmanship, but notoriously bad at completing his jumps without breaking his bones. The logistics of landing without dying began to trouble Knievel only when he was in mid-air. Say this much for him, though: he never demanded that the rest of America get on the bike with him. But let us end on a note of consensus. In the whole of his book, Trump says almost nothing that isn’t appalling, in one way or another. But who can quarrel with the first two words of his title? America is crippled, all right. It just isn’t crippled in the way he thinks it is. Thoroughly self-obsessed, but thoroughly lacking in self-knowledge, Trump is the last man equipped to see that the direst symptom of America’s malaise is his own squinting, ludicrous presence on the national stage. Brian Wilson had genius, while Mike Love only had talent. That is the standard thing to say about the two dominant personalities of the Beach Boys. The tortured but indispensable Wilson wrote the irresistible tunes and created the richly textured arrangements. Love, the all-American Everyman, supplied skills of a more practical, material kind. He had rangy good looks. He sang some but not all of the lead vocals; wrote some but not all of the best lyrics; became the touring band’s gawkily bopping front man after Brian, crippled by stage fright and mental illness, retired from performing to stay home and write songs. Love, with some justification, thinks the conventional reading of Beach Boys history sells him short. It’s not that he minds Wilson being called a genius; indeed he’s ready to call him one himself. But he resents the notion that the remaining Boys were “Brian’s puppets,” or “nameless components in Brian’s music machine.” His new memoir is an attempt to set the record straight – to write his way out of the genius’s shadow. The book is called Good Vibrations, but I believe I picked up a few bad vibrations in it too. For an adept of Transcendental Meditation, Love sure knows how to nurse a grudge. Well, his timing is certainly diabolical. At the very moment when Love has tried to overhaul the narrative, Brian Wilson has published a near-simultaneous memoir of his own. And while Love’s book is merely pretty decent, Wilson’s turns out to be freakishly, genre-transcendingly good: a rock memoir of genius, if ever there was one. Love, it seems, just can’t catch a break. He’s not the Antichrist, but he does call to mind another thwarted figure. He’s a surfin’ Salieri, forever doomed to be outshone by Wilson’s flaky Amadeus. Whatever the latest version of the Greatest Hits is called, though, it will always sound gloriously fresh. Nor can it be denied that Love’s verbal contributions are a good part of the reason why. A song like “Fun, Fun, Fun,” gets a lot of its verve from its compact, propulsive lyrics. “Well she got her daddy’s car and she cruised through the hamburger stand now / Seems she forgot all about the library like she told her old man now.” There’s a lot of movement and freedom and Americana crammed into those opening lines. If Wilson is to be called a genius for writing the tune, then surely Love was a kind of genius too, for supplying words that so perfectly mirrored its jauntiness. Love sounds like a cocksure sort of guy: you wouldn’t necessarily want to meet him. 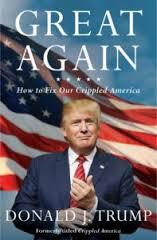 But his hyper-confidence makes his book an unusually honest one. Because he thinks he’s always right, he leaves nothing out. 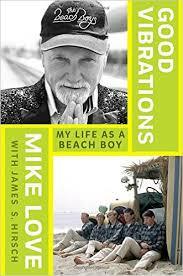 Indeed his memoir has a panoramic clarity that Wilson’s lacks: if you don’t know much about the Beach Boys, Love’s is the better book to start with. Wilson throws his story out in a staccato, out-of-sequence way; he seems to assume that the reader will already be pretty familiar with Beach Boys lore. Such an approach is unusual in a rock memoir. But it ends up being brilliantly unusual, like Wilson himself. Love should count himself lucky not to be a genius, if being one means having to live with the package-deal of misfortunes and afflictions that have been visited on Wilson since birth. For starters he had a domineering and violently abusive father. He also had a predisposition to depression and anxiety. As a child he was whacked with a lead pipe by a neighbourhood ruffian, leaving him 95% deaf in one ear. His habit of singing and talking out of the other side of his face makes him look, by his own admission, like a stroke victim, or the recipient of a dentist’s needle. At the age of 22 he began hearing voices in his head. The extent to which these hallucinations can be blamed on his then-monstrous intake of LSD remains unclear. He is still plagued by voices today, even while performing. He spent a good chunk of the seventies and eighties being overmedicated by a mysterious guru named Dr Gene Landy, whose interventions converted him into a housebound zombie. Piling on top of each other in slow drifts, sentences like that give you a sense of how it must feel, roughly, to be Wilson. It seems a good guess that Ben Greenman, Wilson’s co-author, deserves a lot of credit for creating this uncanny effect. A lesser ghostwriter – almost any ghostwriter – would have smoothed away Wilson’s weirder edges, including his thoughts about Eyewitness News, and given his story conventional shape. Celebrity ghostwriters tend to iron out the quirks, as if their job is to make every memoir sound like every other memoir. Instead Greenman has taken the bold step of preserving Wilson’s eccentricities, letting them soak deep into the book’s fabric. Thus Wilson, as a narrator, has a habit of discussing, as if we should know them, people he has never discussed before. On page 12 the enigmatic Dr Landy, having so far received just one fleeting mention, suddenly walks out of Wilson’s front door forever, with an oddly perfunctory cry of “I am leaving because I lost my licence … Bye, Brian.” To find out who Landy is, and what he was ever doing there, we have to wait until Wilson’s thoughts loop back to him in another context. Wilson’s father, too, circles into the text and then back out of it, ominously. “The things with my dad happened almost from the beginning,” Wilson writes early on, “but I’ll talk about them later.” He doesn’t want to discuss these things prematurely, because “it’s easy to misunderstand them, even for me.” When Wilson is finally ready to tackle the father theme in earnest, something odd happens. The book entirely shakes off the limits of its genre. It dawns on you that you’re reading a moving and highly intelligent piece of writing. Wilson’s prose proves to be a literary instrument, sensitive enough to register how it feels to hate and fear and love a person at the same time. The way that Brian made complexity sound simple, Mike Love says, was “one of the secrets to his genius.” Allied with that gift was his knack for transmuting turmoil into beauty, often with the aid of Love’s sunny lyrics. Both Wilson and Love have written books that burrow fearlessly back the other way, and expose the messy, discordant truths that underlay the harmony. Neither man pretends to be perfect, or anywhere near it. But together, for a while, they made songs for which perfect is the only word. 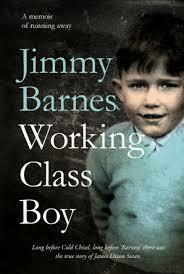 Jimmy Barnes has been trying to get the story of his childhood off his chest since the early nineties. He had abandoned the project twice when a viewing of the movie Snowtown impelled him to push through with it once and for all. “The floodgates opened and I couldn’t hold back the past any longer.” When Snowtown serves as a trigger for the remembrance of things past, it’s a fair sign your childhood was less than ideal. This isn’t, then, a memoir of its author’s career as a rock star. When Barnes brings the book to a close, he has only just joined an obscure Adelaide band called Cold Chisel. Nor is there any other sense in which this book resembles the typical celebrity memoir. Most star autobiographers have nothing urgent to say; their books aren’t driven by the impulses that make a real writer write.